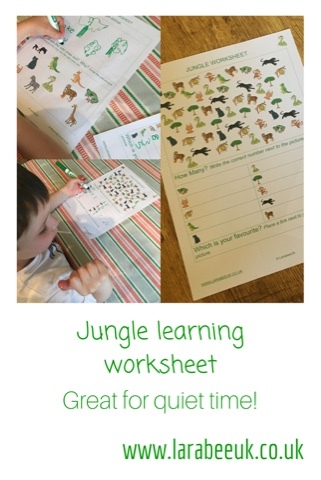 I love child-led learning so when T said he wanted some Jungle activities after becoming besotted with the jungle book I was pleased to create a few for him. This however, is one of his ideas. 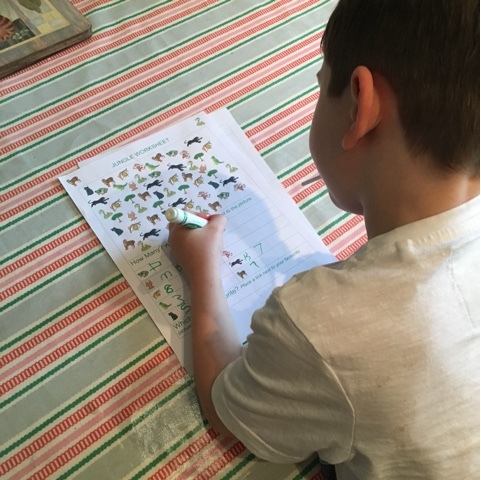 At the moment he is obsessed with writing, generally his letters are fine, but his numbers are not that great so I definitely wanted a worksheet where he could not only practice his counting but also writing some numbers. I pretty much left him to it on this one, which is why you'll see a couple of mistakes and attempts of getting his numbers right. He can't for the life of him grasp ticks, not sure if you've had this? It would be great to hear your experiences, as I'm not sure if this is a leftie trait or just something he struggles with. The jungle worksheet is 2 pages, I usually laminate but I haven't for this one yet. 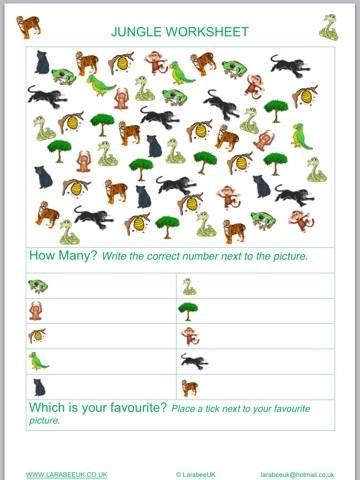 It's split into 3 activities, counting the animals and writing the corresponding number, then denoting the child's favourite with a tick. Drawing a jungle animal, giving the child free reign to draw an animal of this choice, T chose a snake and some trees. I then wrote the word snake for him to copy to extend this a little. 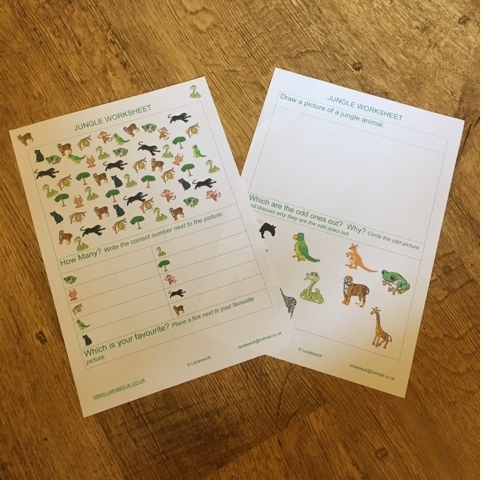 The odd one out, this is great for a discussion topic first to allow you to discuss all the animals with the child and talk about which live where, although it did lead to a little confusion for us when T thought that frogs do not live in the jungle because there's no frog character in The Jungle Book! It's fascinating how their minds work. 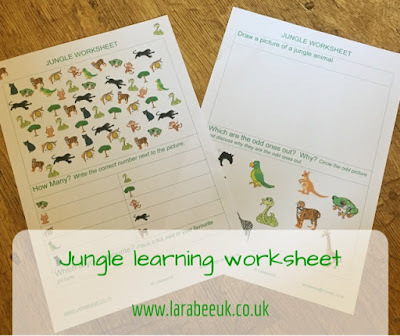 You can download this worksheet below, I'd love to hear your thoughts on it, you like to more more worksheets? Anything specific? 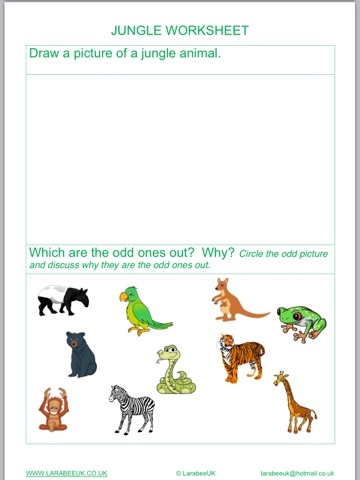 If you like this worksheet you can download it here. Fab sheet! The tick thing may well be a left-handed thing, as my son was the same (he and I are both left handed) and in fact the always seem illogical to me too! 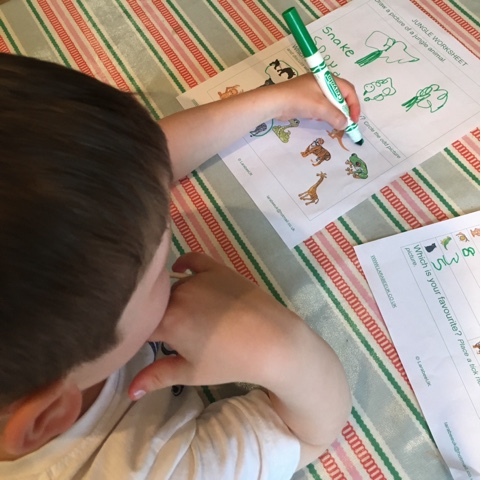 Such a lovely activity and it's fab you share it for otherparents.